Declan Farmer (Tampa, Fla.) scored twice and Josh Pauls (Green Brook, N.J.) added a goal and an assist as the 2018-19 U.S. National Sled Hockey Team edged Canada, 4-1, to maintain its perfect start here at the 2018 Para Hockey Cup. "It's good to get a hard-fought win like this in this environment here early in the season," said David Hoff, head coach of the 2018-19 U.S. National Sled Hockey Team. "We started well but let the game get away from us a bit. I'm happy with how we came together as a team and rebounded in the latter half of the game to get the win." With the win, the U.S. improves to 3-0-0-0 (W-OTW-OTL-L) and has secured a spot in Saturday's (Dec. 8) championship game against Canada. Team USA will close preliminary round action tomorrow (Dec. 7) against South Korea. Puck drop for that game is set for 12:00 p.m. ET and will be streamed live on HockeyTV.com while Saturday's championship tilt will be played at 4:00 p.m. ET. Farmer gave the U.S. an early 1-0 lead just 2:22 into the game. The play started when Noah Grove (Frederick, Md.) carried the puck into the Canadian zone and dished the puck over to Farmer who was able to deke Canadian netminder Dominic Larocque out of position and tuck the puck into an empty net. Just over two minutes later, a pair of breakaway opportunities in a three-minute span nearly doubled the U.S. lead as both Brody Roybal (Northlake, Ill.) and Luke McDermott (Westerlo, N.Y.) saw their individual efforts turned aside. With 4:45 to play in the frame, Canada evened the score when Dominic Cozzolino found a loose puck in the slot and tucked it past U.S. goaltender Steve Cash (Overland, Mo.). Team USA nearly regained its lead less than two minutes later when Josh Sweeney (Portland, Ore.) batted down a clearing pass from Canada and skated in on goal uncontested but saw his shot denied. In the closing seconds of the period, Farmer was able to intercept the puck deep in Canada’s zone and rifle a shot over Canada’s Dominique Larocque for a 2-1 U.S. lead entering the first intermission. 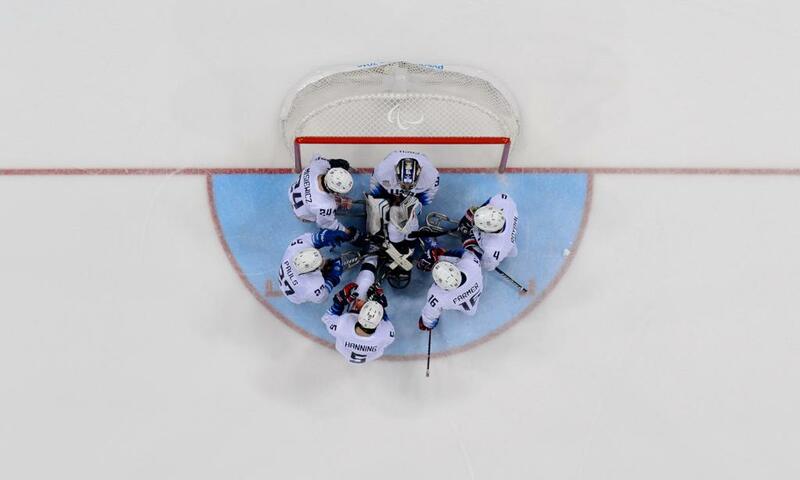 The middle stanza saw the U.S. gain momentum early with a 5-on-3 man-advantage. Farmer had perhaps Team USA’s best chance in the advantage when he curled around the net and sent a shot on goal that was gloved aside by Larocque. Moments later, Roybal carried the puck and circled the entire zone before sending a centering pass through the crease and inches away from a U.S. stick. With 2:24 to play in the period, Kevin McKee (Chicago, Ill.) gave the U.S. a 3-1 lead on a tap-in goal. Farmer started the play in the U.S. zone when he found Roybal alone at Canada’s blue line. After collecting the puck, Roybal skated in for a breakaway chance that couldn’t find its way under the arm of Larocque. With Roybal behind the goal and the puck trickling beside the post, U.S. captain Josh Pauls (Green Brook, N.J.) was able to pull the puck into the crease allowing McKee the tap-in goal. In the final minute of regulation, Pauls stripped the puck from a pair of Canadian defenders in the offensive zone and lifted a shot over a diving Larocque to account for the 4-1 final. NOTES: Declan Farmer (Tampa, Fla.) was named the U.S. Player of the Game ... The U.S. outshot Canada, 16-6, while finishing 0-for-4 on the power play and 4-for-4 on the penalty kill … For complete statistics, click here … Deloitte, Labatt USA and Toyota are proud sponsors of the U.S. National Sled Hockey Team … For complete coverage of the U.S. National Sled Hockey Team, click here.